Responsible boat owners know that enjoying their boat in the summer is possible only if they put in the time and effort to properly winterize their boat in the off-season. Also, lack of maintenance or neglect of the boat could result in costly damage that would not be covered by any insurance policy on the boat. Boats need to be thoroughly cleaned and drained prior to the layup. Inspect the hull and check for any damage. Think of applying a good coating of wax at this time. Ensure the batteries are fully charged and switched off. Your boat may need to be stored either with a full tank of gas, or just with fuel stabilizer added, so make sure you find out what is best for your specific boat. Remove all belongings, electronics and safety equipment from inside your boat. Air out the cushions, or consider storing them at your home in the offseason. Clean out the refrigerator and freezer. 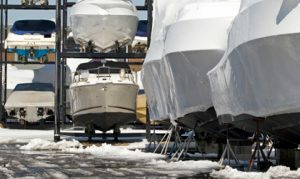 Where is the best place for your boat to be during the winter layup? Ideally your boat should be out of the water, under cover, and in a climate-controlled boat storage facility. A cheaper option is to have your boat shrink-wrapped or at least tightly covered with a tarp or cover. It’s possible to recoup some of the money spent to winterize your boat by temporarily suspending some of your insurance coverages, such as medical liability, that you will not need if your boat has been winterized. Some of our carriers offer a winter layup program for boats, and we would be glad to discuss with you the savings associated with this convenience. Call us at 615-794-9668 if you have any questions. 7 Driving Habits That Are Bad for Your Car Real-Life Cases of Identity Fraud – Could Your Family Be Targeted Next?